Apple is working with Nevada power company NV Energy to build an additional solar farm adjacent to its data center in Reno. It is part of Apple’s “green energy” initiative which also has the company building a couple solar panel farms at its data center in North Carolina. 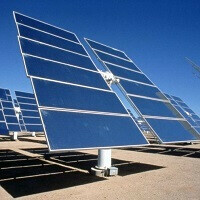 Apple is planning on utilizing a new type of technology for the solar array. The system will use panels in conjunction with mirrors that will concentrate the sun’s energy buy up to seven times into the panels, resulting in greater power generation. The final set up will generate between 18 and 20 mega-watts of power. Nevada state regulators approved the project last month. SunPower is providing the engineering, construction and energy tracker technology that will be used with the completed system. Since Apple is paying the full costs of the construction, the project will not have any effect on the prices of the utility’s other customers. "All of Apple’s data centers use 100 percent renewable energy, and we are on track to meet that goal in our new Reno data center using the latest in high-efficiency concentrating solar panels. This project will not only supply renewable energy for our data center but also provide clean energy to the local power grid, through a first-of-its-kind partnership with NV Energy. When completed, the 137 acre solar array will generate approximately 43.5 million kilowatt hours of clean energy, equivalent to taking 6,400 passenger vehicles off the road per year." Apple will have the option to expand the solar array or even sell the asset to NV Energy sometime down the road. Well, all the news of lawsuit aside, this kind of stuff is quite encourageable! An excellent solution to a problem that should never of existed. I mean, come on!! Building a data center (which requires vast amounts of cooling) in the middle of the dessert? Facebook had the right idea about building theirs in the Alps. Reno area is a high desert but it only gets hot for a couple months a year, the rest is cool or cold, this is no Vegas, I live here.